Housing in California has been notoriously high priced for many years, and Calistoga has been no exception. We would probably all agree that back in 1997 the problem was bad enough- but in the last few years it has become dramatically worse. In the nine years from 1997 to 2006 the average house price in Calistoga skyrocketed from $285,00 to over $800,000, or 180%. Meanwhile, incomes increased only about 25%, dramatically impacting the ability for working families to buy a home. CAH was formed in 2001 to help fulfill what was then seen as an urgent need for housing. 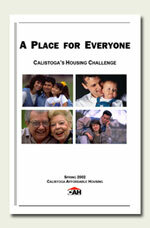 At the time, we completed a description of the housing crisis titled "A Place for Everyone." It makes interesting reading today (you can download a PDF file here), especially to see how much has changed. After seven short years, housing prices in Calistoga are an estimated 70% higher, making them even further out of reach for Calistogans whose incomes haven't kept pace. Housing prices have been increasing far more than twice as fast as our ability to pay. There are many factors creating this problem that we can't do anything about. But there are also many that we can deal with to ease the crunch on those who can't afford today's high housing costs. Affordability (or non-affordability!) is the key subject here. A family is considered to be overpaying if it spends more than 30 percent of family gross income on housing. Overpayment is a serious problem in Calistoga. An estimated 35 percent of all families pay more than 30 percent of their income for housing, and that estimate is believed to be on the low side. The situation gets worse when you consider that overpayment is a far bigger problem among lower income families and renters. An estimated 45 percent of renters and 21 percent of owners are overpaying. Among families near the low end of the economic ladder, upwards of 80 percent have to overpay to have a place to live. Overpayment problems are not the only result we get from a short housing supply. Without enough reasonably priced housing, our local businesses find it hard to attract and keep employees. Many people who have jobs here live in Lake or Sonoma counties where housing is cheaper- and they add to the commute traffic that has become surprisingly heavy for our rural area. Many of our teachers and public employees find they can't afford to live in the area they serve. As high housing prices squeeze out those at the lower end (and many in the middle) of the economic ladder we run the risk of becoming a community of only the "haves" who can afford to live here. Maintaining our economic diversity is an important goal of the general plan, and more affordable housing is critical to achieving that goal. There is no doubt this problem belongs high on our list of issues to actually do something about besides talking. And, there are steps we can take.